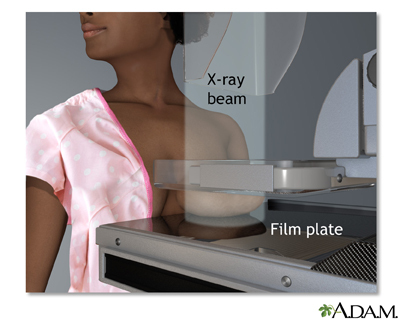 Mammography is a low-powered x-ray technique that captures a picture of the internal structure of the breast. Additional angles and magnified views are taken of suspicious areas. A mammogram may help in the diagnosis of breast problems, including cancer. It is recommended a woman have a baseline mammogram at age 40, followed by a mammogram every couple of years until age 50. After 50, a woman should have a mammogram every year. Updated by: Todd Gersten, MD, Hematology/Oncology, Florida Cancer Specialists & Research Institute, Wellington, FL. Review provided by VeriMed Healthcare Network. Also reviewed by David Zieve, MD, MHA, Isla Ogilvie, PhD, and the A.D.A.M. Editorial team.